We are all looking for motivation trust me when I get up a 5 am to workout, dragging my body out of bed is like pulling meat from a lion. Yes it is hard to get going I am always looking for ideas, tips and tricks to keep me going. LiveStrong.com has come up with dares to motivate it’s members. I think it’s smart, the dares are simple things that remind us to take care of ourselves. Dares include, taking vitamins, getting enough rest, eating fruits and vegetables. What is really cool you can create dares as well, so if you want a little motivation check out LiveStrong.com dares. I have a dare also I dare you to try the 125 core challenge I created. There is a lot of research for and against heavy lifting. 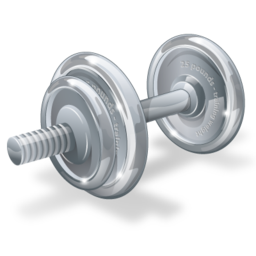 For example a new study conducted at McMaster University has shown that a similar degree of muscle building can be achieved by using lighter weights. The secret is to pump iron until you reach muscle fatigue. On the other side of the fence; other studies have shown that lifting heavy with short resting times burns more fat. Researchers from the Norwegian University of Sport and Physical Education (Oslo) found that using weight that allows for only six reps increases subject’s resting metabolic rate higher and for longer after a workout than 12-rep sets. A study from the College of New Jersey (Ewing) reported that men rested just 30 seconds between sets of bench presses, burned 50% more calories. To burn more calories during and after training (which helps burn bodyfat), use a 6-8-rep range and keep rest periods to less than one minute. Source Muscle & Fitness Oct.2010 issue. Men’s Fitness does a great job in this article of showing you how to stay in shape without a gym. For me personally I don’t belong to a gym because of time. My life at the moment is super scheduled, a day in a life of Nat Jones goes something like this. 7:20 Dressed walking out the door to catch the 7:40 train. 8:20 Arrive in city walk to work. 9:00 am get coffee and protein bar work day starts. I won’t bore you with the details but work usually starts at 9 am finishes anywhere between 5:30 and 7:00 pm on a good day. On a long day I could be there till about 8 pm than I am taking the work home with me. You basically get the idea, if I don’t workout in the morning my day is to hectic to even try working out during the day. The Men’s Fitness article covers euipment you can buy for your home gym and workouts you can do also.